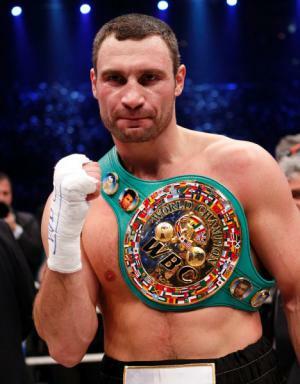 Vitali Volodymyrovych Klitschko, born on the 19th of July 1971, also known as Dr. Ironfist, is a former Ukrainian boxer, politician and author, famously known for holding the WBC, WBO and The Ring Magazine heavyweight titles, and for being the Mayor of Kyiv/Kiev in Ukraine. So how much is Klitschko’s net worth? As of mid-2016, it is reported by authoritative sources to be $65 million, acquired from his long successful career as a professional boxer, his product endorsements and his career in politics. Born in Belovodsk in the Soviet Union, Klitschko is the son of Soviet Air Force Colonel Vladimir, and Nadezhda, a former attendant. In 1985, the family move to Ukraine where he pursued further education, graduating in 1996 from the Pereyaslav-Khmelnytsky Pedagogical Institute in Ukraine, and then pursuing postgraduate study at the Taras Shevchenko National University of Kyiv where he finished in 2000 with a PhD. Klitschko’s amateur career started in 1992, and in 1995 he got the chance to compete at the first World Military Games in Italy, where he won the super heavyweight championship. His victory was followed by the Amateur Boxing Championships in which he took home the silver medal. In 1996, he tested positive from steroids that prevented him from participating in the Olympics, ending his amateur career. In 1996, Klitschko officially turned professional. The early years of his career consisted of a series of wins, defeating fighters like Julius Francis, Jose Ribalta and Ismael Youla, with either a KO or a TKO. In 1999, he became a boxing star when he bagged his first WBO heavyweight title against Herbie Hide. Unfortunately he was then forced to concede the title to Chris Byrd because of an unbearable pain during the fight, which was later discovered as a torn rotator cuff. Klitschko once again made headlines when he took home the WBC heavyweight championship in 2004, defeating Corrie Sanders after eight gruelling rounds. He stepped away from boxing from 2005 to 2007, returning in 2008 when he regained his WBC Heavyweight title in October after defeating Samuel Peter. His successful career in boxing made him a well-known personality and tremendously helped his net worth, until in 2013 he decided to hang up his gloves, with 45 wins in 47 fights. Aside from fighting, Klitschko’s other source of wealth has come from product endorsements; some of them include McFit, Telekom, Mercedes and Hugo Boss. He also has his own firm, KMG that managed and organised all his professional fights. In 2003, Klitschko along with his brother Wladimir Klitschko also released their book “Our Fitness. Simple Secrets of Champions” that became an instant bestseller and also increased his net worth. Today, Klitschko is the sitting Mayor of Kyiv in Ukraine and also the head of the Kyiv City State Administration. Since 2005, Klitschko has been actively participating in Ukraine’s politics and desires to eradicate corruption and bring more transparency to government. In terms of his personal life, Klitschko has been married to former model and athlete Natalia Egorova since 1996, and together they have three children. 1 It's not the belt that matters, it's the audience who determines the champion. But I believe I'm the best in the world. 4 Before losing to Chris Byrd was 27-0(27), a Heavyweight record for consecutive knockout wins from the beginning of a career. 5 During a sparring match that was meant to prepare him for his scheduled 12 November 2005 fight with Haseem Rhamin, Vitali's knee was injured. He had surgery on 8 November 2005 for a rupture in the torn anterior cruciate ligament (ACL) and damage to the medial meniscus on his right knee. After learning that it would be a fairly long time before he would be allowed to fight again, Vitali made his announcement to retire on 9 November 2005. 6 Although he and his wife are both citizens of Ukraine, his children are American citizens, as they were all born at Cedars-Sinai Medical Center in Los Angeles, CA, USA. 7 Has three children with wife Natalia: Egor-Daniel Klitschko (b. 16 May 2000), Elizabeth-Victoria Klitschko (b. 23 November 2002), and Maxim Klitschko (b. 1 April 2005). 8 He and his younger brother, Wladimir Klitschko, have protested and demonstrated in the Ukraine for democracy and for the re-vote election of Viktor Yushchenko. 9 He and his brother, Wladimir, grew up as the sons of a helicopter pilot in the Soviet Union's armed forces. 10 Speaks four languages: Russian, Ukrainian, German, and English. 11 Lives mainly in Los Angeles, California, USA. He also has houses in Hamburg, Germany and Kyiv, Ukraine. 12 Has a doctorate degree from Perevaslav-Khmelnitsky Teacher Training Institute (1996). His PhD is in Sport Science and Philosophy. 13 Older brother of Wladimir Klitschko, WBO heavyweight champion, and companion of István Kovács, WBO featherweights champion. 14 Fourth boxer besides Muhammad Ali, Evander Holyfield and Lennox Lewis to win a heavyweight belt for the third time.